The Atlas Mountains can be a fantastic place to be in the winter (November to May). Day time temperatures can often reach 20 degrees C with crisp clear sunny skies and mountain-tops glistening with snow. With very few people on the trails it can rival some of the best trekking in the world. At nights and at altitude things get a little colder. Expect night time temperatures around freezing point and permanent snow cover above 3000m. There is frequently snow on the high passes and peaks in the High Atlas Mountains from November through to the end of March. On all treks which include climbing Toubkal during these months there is a strong chance you will need to use crampons and ice axes. It is imperative that you have suitable prior experience of using crampons and ice axes before attempting such a trek with local mountain guides. Crampons & ice axes can be hired locally in Imlil. Our standard recommended itinerary for Toubkal in winter involves a day to trek from Imlil to the Toubkal Refuge, a day each climbing Ouanakrim and Toubkal and then a fourth day descending back to Imlil. Ouanakrim offers two twin peaks over 4,000, is a stunning climb and great preparation for climbing Toubkal. For those with experience of winter mountaineering and using crampons and ice axes we do offer a fantastic value winter Toubkal climb with experienced local mountain guides. All qualified local mountain guides will have completed a six month training school in Tabant with the Royal Moroccan Federation of skiing and mountaineering. This training is a pre-requisite qualification for any Mountain or Desert guide in Morocco and qualifies the holder to lead treks anywhere in Morocco. The qualification is the equivalent to the British Mountain Leader summer scheme and whilst it does include a qualification for rope work and some training in snow techniques, it is not equivalent to the British Winter Mountain Leader qualification or the International Mountain Leader qualification. 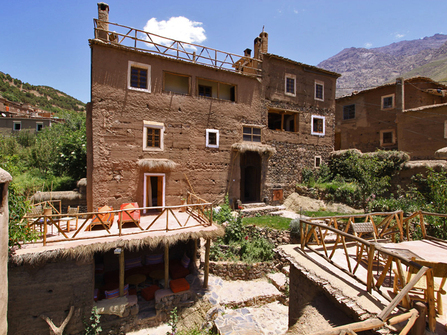 For those who just want to come out and explore the Atlas Mountains and enjoy the scenery there is a wonderful three day trekking itinerary through the Ouirgane National Park and Azzaden Valley. The trek stays below the snow-line where the weather is usually warm and sunny. The trails are very quiet, the views of snow-capped Toubkal are stunning - all in all it is simply fantastic trekking.